We provide integrations with Xero, QuickBooks Online, MailChimp, and Adobe Sign. If you’d like to develop integrations with other solutions or use data from your Current RMS system in your own projects, use our open API. The Current RMS API allows you read/write access to the data in your system. The API is a developer tool. It’s intended for developers who are confident at programming and have experience using APIs. If you don’t have development experience, contract a third-party developer to help. We provide limited, high-level support for the API. Our team are happy to help when the API isn’t working as expected or with high-level development questions, but we’re not able to answer general questions about development or advise on using APIs in a broad manner. The API is comprehensively documented. We’re not able to suggest whether an integration with a particular third-party solution is feasible or how you’d go about creating an integration. Our API is well documented, so you can investigate the data you’ll need. We don’t have recommended developers. Current RMS is a global solution, used by customers in a variety of countries and industries. For this reason, we can’t recommend a developer or agency. 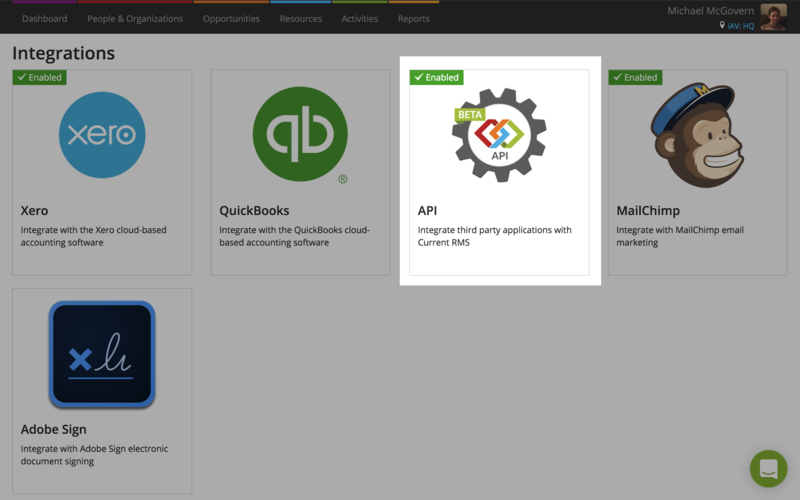 Head to System Setup > Integrations > API to generate API keys and access our comprehensive developer documentation. Simply sign up for a free 30 day trial of Current RMS on our website to get access to a system that you can use for testing. It’s best to start a conversation with our customer success team after sign up to let us know you’re using the account for API development.